Eugène de Beauharnais was born on Sep. 3, 1781 in Paris, of vicomte Alexandre de Beauharnais (1760-94) and Joséphine Tascher de la Pagerie (1763-1814). His sibling was Hortense (1783-1837). They became the step-children of Napoléon Bonaparte after he married their widowed mother on 9 March 1796 (civil ceremony; the religious ceremony took place on Oct. 30, 1804, prior to Napoléon's coronation). Napoléon took a strong liking to Eugène, and tried to be a father for him. He constantly protected him and advanced his career: at 18, Eugène served as aide-de-camp of Bonaparte in Egypt, became colonel in 1802 at 21, general in 1804, and was made Arch-Chancellor of State, prince of the Empire with style of Most Serene Highness. After Napoléon created the kingdom of Italy in 1805, Eugène served as his viceroy, from June 7, 1805 to the end of the kingdom in 1814. Napoléon, who was still childless by his marriage with Joséphine, adopted Eugène on January 12, 1806, with no succession rights in France. The reason for this was the Senatus-consulte of May 18, 1804 (in effect, the constitution of the Empire) restricted the succession to the Imperial dignity, in article 4. In particular, although Napoléon could adopt the sons or grandsons of his brothers if he had no children, but an adoptee from outside the Bonaparte family had no rights. Correspondingly, the decree of March 30, 1806 which sets down rules for the imperial family distinguishes between dynasts (as defined by the constitution), sisters of Napoléon and their descent, and adopted children of Napoléon and their descent. Eugene was thus not dynast but member of the imperial family. As such, his marriage was subject to prior written, sealed assent of the emperor on pain of nullity. Two days later (with Napoléon's approval of course), he married Augusta of Bavaria (1788-1851), daughter of the king of Bavaria. 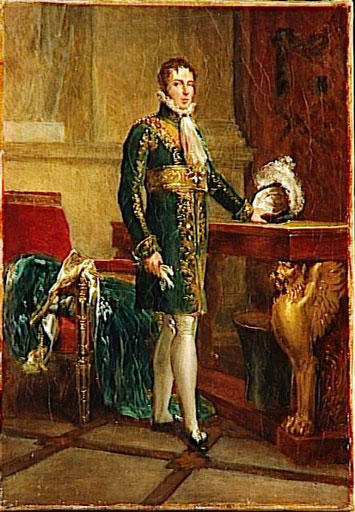 An Italian constitutional statute of February 16, 1806 made Eugène heir presumptive to the throne of Italy: he was to inherit that throne in the absence of a surviving second son of Napoléon I. The title of prince of Venice, created by article 9 of the decree of March 30, 1806 for the heir presumptive of Italy, was granted to Eugene on December 17, 1807 (I have no explanation for the delay). Eugène's situation was thus rather unusual. He was a prince français and officially a member of the French Imperial family, but he was not a French dynast, and had no rights of succession to the throne of France. In the kingdom of Italy, he was a viceroy, and heir presumptive, but his right was contingent: should Napoléon have a second son, that son would become king of Italy in Eugène's stead. Eugène's position was not affected by the divorce of Napoléon and Joséphine in 1810. In fact, the grand-duchy of Frankfurt is alleged by some to be a form of compensation for that divorce. Karl-Theodor-Anton-Maria Dalberg (1744-1817) became co-adjutor of the Archbishop of Mainz with succession rights in 1787; he succeeded on July 26, 1802, being also prince-bishop of Konstanz since 1800 and bishop of Worms. As archbishop of Mainz, he was one of the Electors of the Holy Roman Empire and its Arch-Chancellor. 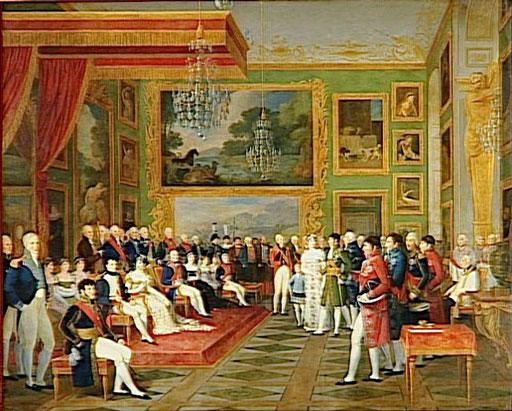 The Reichsdeputations-Hauptschluß of 1803 secularized all eclesiastical states of the Holy Roman Empire, including Konstanz and Worms. The only ecclesiastical member of the Reichstag to survive the reorganization was Dalberg, whose see of Mainz was transferred to Regensburg, along with the titles of Elector, Arch-Chancellor and Primate of the German Peoples. He also received the former principality of Aschaffenburg and the county of Wetzlar. Dalberg was in Napoléon's graces and worked on his behalf. When the Confederation of the Rhine was created by treaty of 12 July 1806, Dalberg was made its Prince-Primate, and he received the principality of Loewenstein-Wertheim, the county of Rheineck, and the formerly Free Imperial city of Frankfurt-am-Main. Altogether his territory represented altogether 34 square miles and 161,000 inhabitants in 1808. Dalberg had tried to involve Napoléon in the affairs of the Confederation in order to replace the Holy Roman Empire with a new order for Germany. In May 1806, he unexpectedly announced that he had chosen Cardinal Fesch, Napoléon's uncle, as co-adjutor and therefore successor, having consulted neither Napoléon, nor the Roman Emperor, nor the Pope, nor even Fesch. Napoléon did not approve, but, although the treaty of 1806 creating the Confederation gave him, as "Protector", the right to appoint the successor to the Prince-Primate (art. 12), this issue was not resolved until 1810. At that time, on the occasion of Dalberg's cession of Regensburg to Bavaria, a successor was chosen, in the person of Eugène. Fesch was asked to renounce his rights, which he gladly did. A treaty of February 16, 1810 between France and the Prince-Primate of the Confederation of the Rhine united the Prince-Primate's possessions (to which had been added Hanau, Fulda, and the part of the county of Lôwenstein-Wertheim on the right bank of the Main) into a Grand-Duchy of Frankfurt (art. 1); the Grand Duchy would belong to the Prince-Primate for him to enjoy throughout his life in full sovereignty within the framework of the Confederation (art. 2). Article 3 stated that, after the his death, the Grand-Duchy, by virtue of a donation presently made by Napoléon to Eugène, would belong to Eugène and his legitimate male issue by primogeniture, with reversion to France in case of default. The resulting Grand-Duchy of Frankfurt covered 83.5 square miles and had 300,000 inhabitants; it was the tenth largest sovereignty in the Confederation, after Bavaria, Württemberg, Westphalia, Saxony, Berg, Baden, Hesse-Darmstadt, Mecklemburg-Schwerin, Würzburg (see Jean-Engelbert d'Arenberg: Les Princes du Saint-Empire. Louvain, 1951, pp. 159, 182-5). The Confederation disintegrated in the wake of Napleon's defeats, particularly the battle of Leipzig on Oct. 16, 18 and 19, 1813. Dalberg abdicated his secular titles in a letter of 26 October 1813 in favor of his appointed successor Eugène, asking the king of Bavaria to take over his grand-duchy in Eugène's name; Dalberg then fled to Konstanz. This succession was never recognized by the Allies, however, who were committed, by virtue of the secret articles of the treaty of Toeplitz (9 Sept. 1813) to the dissolution of the Confederation and the rearrangement of the territories of Germany. Dalberg's abdication was made known in Frankfurt on October 30; the same day, Napoleon defeated an Austro-Bavarian army at nearby Hanau and thereby opened a free path back to France. During that night his troops marched past Frankfurt, and he was received by the mayor of Frankfurt. The French garrison left Frankfurt that night. Allied soldiers started arriving in the following days and Philip of Hesse-Homburg officially took over the city in the name of the Allies on November 6. A declaration of 14 Dec 1813 by the Allies restored Frankfurt ot its "original municipal constitution". It was made a free city and member of the German Confederation by the Congress of Vienna. (Pölitz: Die Europäischen Verfassungen, Leipzieg 1832, vol. 1. p. 1130.) It is thus unlikely that Eugène was ever "recognized" in the few days between the departure of French troops and the taking over by the Allies. Meanwhile, Eugène was commanding the French and Italian troops in Italy; in the armistice document signed on 16 Apr 1814 with the Austrians And British forces, he is called "Son Altesse le Prince Vice-Roi" (see full text here). "1. Les droits du prince Eugène à établir un établissement convenable hors de France, conformément à la convention du 11 Avril lui sont confirmés. Les hautes Puissances alliées s'engagent à lui donner un établissement aussitôt que les circonstances n'y mettront plus d'obstacle. 2. Le prince Eugène recouvrera et conservera la libre et entière jouissance de ses dotations et de ses biens particuliers, tant meubles qu'immeubles, dans tous les pays qui ont fait partie du Royaume d'Italie, quels que soient les Souverains auxquels ces pays appartiennent ou par les troupes desquels ils sont occupés. 3. Le château de Baireuth et ses dépendances sera assigné par S.M. le Roi de Bavière, au Prince Eugène, pour y faire sa résidence avec sa famille." As a consequence, he was able to retain his estates in Italy, Germany and France. He settled at the court of his father-in-law in Bavaria, and was made on 14 Nov 1817 duke of Leuchtenberg and prince of Eichstätt, with style of Royal Highness for himself, and style of Most Serene Highness and First Hereditary Prince after the royal family of Bavaria (the title of Eichstätt was retroceded in 1855). He died on 21 Feb. 1824 in Munich. Écartelé, au 1, d'argent à la fasce d'azur; au 2, de gueules à la porte de ville crénelée d'argent, ouverte de sable, posée sur une terrasse de sinople, flanquée d'un mur sommé de deux tours créne;lées d'argent, soutenant chacun un chêne de sinople; au 3, de sinople à l'épée haute d'argent en pal, garnie d'or, accostée de charque côté de trois étoiles du même, 2, 1; au 4, d'argent à la fasce de sable, accompagnée de trois merlettes du même en chef; sur le tout, d'azur à la couronne royale d'or. The 1st quarter is that of the counts of Leuchtenberg, a reichsständische family extinct in 1646; the 2d is that of Eichstätt; the 4th quarter are the arms of Beauharnais. Perhaps no one came so close to being a sovereign without ever being one. His mother became an Empress, his sister Hortense married the king of Holland (Napoléon's brother Louis) and his nephew became Napoléon III. Eugène himself was heir to Italy and to Frankfurt but never acceeded. Of his children, Auguste (1810-35) married the Queen of Portugal, a daughter married the king of Sweden, another the Emperor of Brazil. His other son, the third duke of Leuchtenberg Maximilian (1817-52) was considered as a candidate for the throne of Belgium, and when the Belgian national congress voted on February 2, 1831, he received 74 votes against 97 for the duc de Nemours (the duc de Nemours refused because of English pressures and Leopold of Saxe-Gotha was chosen instead on July 21). Maximilian's son would later be the candidate for the throne of an independent Hungary favored by the Hungarian exiles led by count Csaky in 1866. Maximilian married in 1839 Maria Nicolaevna, daughter of Emperor Nicholas I of Russia, and was granted the style of Imperial Highness as personam. After his death their surviving children were granted the title of Princes and Princesses Romanovsky, with rank equal to that of great-great-grandchildren of the Russian Emperor (1857); but they were never truly members of the Imperial family as defined in the Russian house laws. The male posterity of his eldest son Nikolai Maximilianovich exists, albeit by a marriage whose validity has been the object of some debate. Eugène also inherited at his mother's death in 1814 of the duchy and estate of Navarre, near Évreux. After the death of Maximilian, his widow applied on behalf of her children to receive the inheritance; but the ministry of finance, invoking a decree of August 26, 1811 which deprives of their titles individuals naturalized abroad without consent, and noting that the Romanovsky's status as members of the Russian Imperial family prevented them from making the oath of allegiance required to succeed in a majorat by the law of March 1 1808, declared the majorat and title forfeited on Aug 9 1853, and the estate of Navarre returned to the National Domain. The duchess appealed, but the decision was upheld by Arrêt of the Conseil d'État on September 1, 1858. The title thus became extinct. Art. 1er. Les possessions actuelles du Prince-Primat (excepté Ratisbonne [etc]) sont réunies en un seul et même état sous le titre de Grand Duché de Francfort lequel fera partie de la Confédération du Rhin. Art. 2. Le Grand Duché de Francfort appartiendra à S. A. Em. le Prince Primat pour en jouir sa vie durant en toute souveraineté conformément aux principes de la Confédération. Art. 3. Après le décès de S. A. Em. le Prince-Primat, le susdit Grand-Duché, en vertu de la donation qui en est présentement faite par S. M. l’Empereur des Français, roi d’Italie, etc, au Prince Eugène Napoléon, sera possédé en toute souveraineté et propriété par ledit Prince et sa descendance naturelle et légitime de mâle en mâle par ordre de primogéniture à l’exclusion perpétuelle des femmes et avec réversibilité à la Couronne Impériale dans la cas où ladite descendance masculine directe viendrait à s’éteindre. Napoléon, par la grâce de Dieu et les constitutions, Empereur des Français, Roi d'Italie, Protecteur de la Confédération du Rhin, Médiateur de la Confédération Suisse. Les actes de la confédération du Rhin et les traités existans, ayant mis à notre disposition le grand-duché de Francfort pour former un Etat héréditaire au jour du décês du Prince-Primat, nous avons jugé ne devoir laisser aucun doute sur l'intention où nous sommes que nos Etats Directs ne dépassent pas le Rhin. Nous avons voulu en même tems fixer le sort des habitans du grand-duché de Francfort, en les confiant à un prince qui nous a donné des preuves multipliées de toutes les qualités qui doivent garantir la durée de leur bonheur. Nous avons, en conséquence, résolu de céder et nous cédons, par les présentes, à notre cher fils le prince Eugène Napoléon, tous nos droits sur le grand-duché de Francfort. Nous entendons qu'au jour du décès du Prince-Primat, il entre immédiatement et de plein droit dans la pleine et entière prossession des principautés, seigneuries, domaines et terres formant le grand-duché de Francfort, pour en jouir en toute propriété et souveraineté aux mêmes droits, charges et conditions que le prince actuel, et avec les mêmes prérogatives, notamment celle qui lui est attribuée par l'article X de l'acte de Confédération. Le grand-duché de Francfort sera hérédiaitre dans la descendance directe, naturelle et légitime de notre cher fils le prince Eugène Napoléon, de mâle en mâle, par ordre de primogéniture, et à l'exclusion perpétuelle des femmes. Venant à s'éteindre, ce que Dieu ne veuille, ladite, ou ledit prince Eugène Napoléon, comme prince d'Italie, venant à être appellé à la couronne de ce royaume, nous nous réservons, et à notre couronne, d'exercer de nouveau la prérogative qui nous appartient en vertu de l'article XII. de l'acte de Confédération. Donné en notre Palais des Tuileries, le 1 mars 1810. 26 AOÛT 1811.— Décret concernant les Français naturalisés en pays étranger avec ou sans autorisation de l'empereur, et ceux qui sont déjà entrés ou qui voudraient entrer à l'avenir au service d'une puissance étrangère. TITRE II. Des Français naturalisés en pays étranger sans notre autorisation. 6. Tout Français naturalisé en pays étranger, sans notre autorisation, encourra la perte de ses biens, qui seront confisqués; il n'aura plus le droit de succéder; et toutes les successions qui viendront à lui échoir parsseront à celui qui est appelé après lui à les recueillir, pourvu qu'il soit régnicole. 7. Il sera constaté par-devant la cour du dernier domicile du prévenu, à la diligence de notre procureur général ou sur la requête de la partie civile intéressée, que l'individu s'étant fait naturaliser en pays étranger, sans notre autorisation, a perdu ses droits civils en France; et, en conséquence, la succession ouverte à son profit sera adjugée à qui de droit. 8. Les individus dont la naturalisation en pays étranger sans notre autorisiation aurait été constatée, ainsi qu;il est dit en l'article précédent, et qui auraient reçu distinctement, ou par transmission, des titres institués par le sénatus-consulte du 14 août 1806, en seront déchus. 9. Ces titres et les biens y attachés seront dévolus à la personne restée Française, appelée selon les lois, sauf les droits de la femme, qui seront réglés comme en cas de vuidité. 10. Si les individus mentionnés en l'article 8 avaient reçu l'un de nos ordres, ils seront biffés des registres et états, et défense leur seront faites d'en porter la décoration. 11. Ceux qui étaient naturalisés en pays étranger, et contre lesquels il aura été procédé comme il est dit aux articles 6 et 7 ci-dessus, s'ils sont trouvés sur le territoire de l'empire, seront, pour la première fois, arrêtés et reconduits au-delà des frontières; en cas de récidive, ils seront poursuivis devant nos cours, et condamnés à être détenus pendant un temps qui ne pourra être moindre d'une année, ni excéder dix ans. 12. Ils ne pourront être relevés des déchéances et affarnchis des peines ci-dessus que par des lettres de relief accordées par nous en conseil privé, comme les lettres de grace. 13. Tout individu naturalisé en pays étranger sans notre autorisation qui porterait les armes contre la France sera puni conformément à l'art. 75 du Code pénal. MAJORATS.— PRINCE ÉTRANGER.— SERMENT.— DÉCHÉANCE. — Le titre et la dotation sont indivisibles, et il n'y a lieu de distinguer (quant aux conditions de transmissibilité) entre la jouissance des honneurs attachés au titre de duc et la jouissance de la dotation affectée au maintien de ce titre. —En conséquence, les fils d'un titulaire décédé — qui sont nés princes étrangers, ayant un droit éventuel à l'hérédité d'une couronne étrangère, — qui, d'ailleurs, ne se prétentent pas au titre de Français et ne réclament pas cette qualité, — ne sont pas aptes à réclamer les biens composant la dotation affectée au titre de duc de Navarre. Art. 1er. La requête à nous présentée au nom de S.A.I. Madame la grande-duchesse Marie-Nicolaewna de Russie, veuve de de S.A.I. Maximilien-Eugène-Joseph, duc de Leuchtemberg, prince d'Eichstaedt, au nom et comme tutrice des princes ses fils, est rejetée.